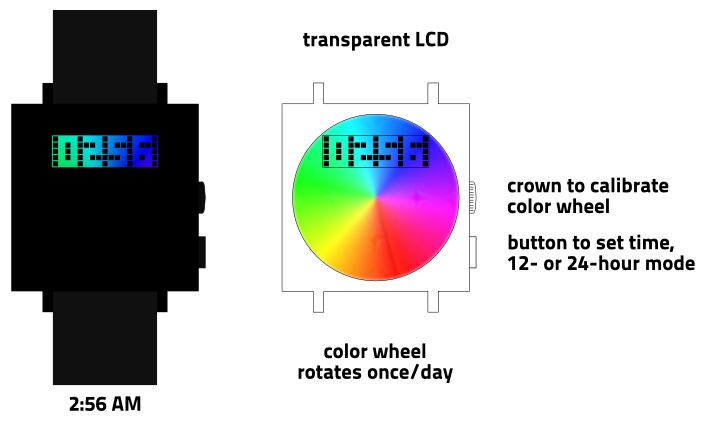 Logan says: How to add color to an LCD watch in a way that is functional? 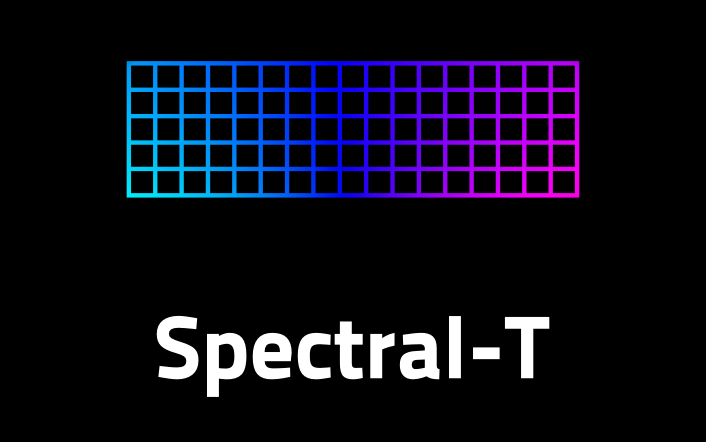 Spectral-T puts a transparent LCD over a rotating color wheel, so varying color shows through the negative space in the display. The color wheel rotates once per day, with blue aligned to midnight and yellow to noon. The always-on LCD gives the precise time, and the colors simultaneously convey the approximate time. The display can be set to 12- or 24-hour mode, and the colors serve the additional function of distinguishing between AM and PM in 12-hour mode. In addition to a button to set the time and mode, a crown allows manual calibration of the color wheel’s alignment — for example, resetting blue to midnight after a battery replacement, or changing the scheme so red is the time you need to leave your house to go to work or school. For the adventurous, optionally turn off the LCD and see time purely through color. Spectral-T is for watch lovers who want a new form without sacrificing any function. This entry was posted in Design Submissions and tagged Analog, Digital Watch, disc, dots, futuristic, hybrid, LCD Watch, Minimalist, sci-fi watch, unisex, Watch Design Submission. Bookmark the permalink. The idea of representing time through a progression of colour is really cool. The rotating disc & transparent LCD work well together. Its almost a shame to have the disc hidden within the case actually. Perhaps an alternate model could have a semi-transparent case so we can see the inner workings. Hey, Logan! I like the idea of manually setting a color to your favorite time of day, or a crucial time as you suggested. I like color change. I like minimal. I like a decent blocky watch case in certain times. Giving transparent LCD a proper new dimension is definitely worth thinking about. The thing is, one would really get used to the watch pretty quick due to the ‘normal’ numbers. But that could be part of the message of the watch of course. What would I try now… Maybe even slimmer display, 3pixel high numbers (which are sort of cryptic already). The more unusual (while staying minimal) the better. Full visibility of the color wheel would give away of its ‘secret’. Thanks for the comments and ideas, all. Glad to see the blog is back! Regarding visibility of the color wheel, how about having a removable faceplate, so the user can change from opaque to semi-transparent? I like that idea. It could be fastened with screws. I like the idea to see the wheel more. I’m confused about the “change once a day”. I feel like it should evolve as the time pass. Hi, thanks for your comment. By “once per day,” I meant that the wheel makes a full 360 degree rotation over the course of 24 hours. It is always rotating.